Evolutionary biogeography - How are flora and fauna distributed across the globe? The regions are mainly defined by the distribution of birds and mammals, and might not have been recognized if other groups had been used. Botanists, for instance, tend to draw different lines on the map: they usually combine the Nearctic and Palearctic regions opposite in one larger region called the Boreal, or the Holarctic, and recognize a separate floral region, called the Cape, in southern Africa. The map opposite, therefore, does not illustrate a set of hard-and-fast facts; the regions are approximate. The regional terms - like Nearctic and Neotropical - are often used in biogeographic discussion. How were these regions chosen? 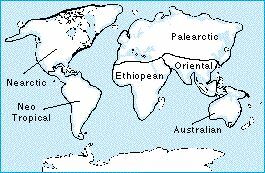 Figure: the world has been divided into six main biogeographic areas, according to the similarity of their animals. The discontinuity between the Oriental and Australian regions is known as the Wallace line.